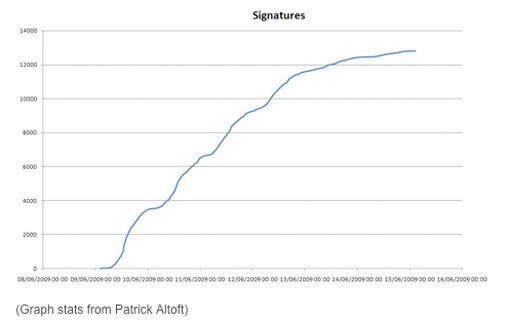 Less than a week ago, more than 6000 people signed a Twitition asking Google Earth to update satellite images of Tehran. Within 24 hours, Google responded with up-to-date images. Mission success. When they heard Microsoft wasn't planning on supporting CSS and other design standards in Outlook 2010, the Email Standards Project and Campaign Monitor took action. 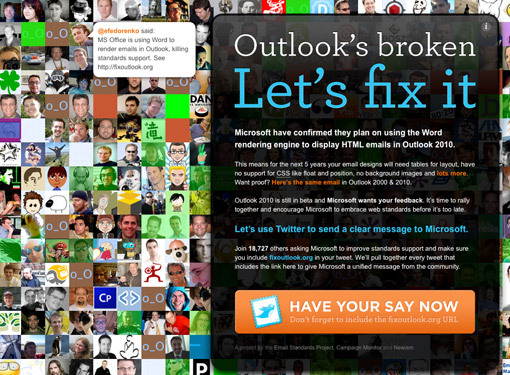 They created fixoutlook.org (maybe the most beautiful of the bunch) to encourage tweeple to spread the news about Microsoft Outlook's layout issues. 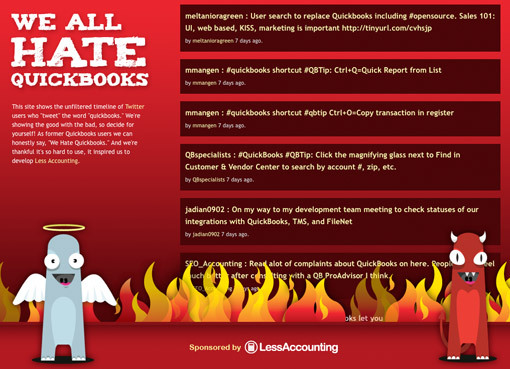 The site displays a wall of the avatars of every twitter user who tweeted 'fixoutlook.org' and highlights specific tweets through conversation bubbles. The site is continually updated every 16 tweets. 18,000 tweets later (the site was launched earlier today), Microsoft released this announcement. It looks like Microsoft is sticking to their guns for now. But who knows, with enough nay-sayers, maybe they'll change their mind. Twitter has gotten a ton of press in the last few weeks because of the important role it's playing as a news source for the political chaos in Iran. So it only makes sense that Twitter users have found a way to show their support, by giving their Twitter avatar a greenish hugh. Doesn't sound like much? 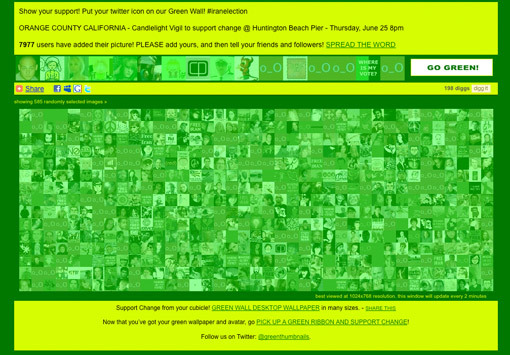 Well when almost 8000 people band together and iran.greenthumbnails.com displays those avatars as a united Green Wall of support, it became something truly special. These people realized the potential of Twitter far beyond 140 simple characters. The power of Twitter is its connectivity. How else have people truly utilized Twitter's potential? Share your thoughts in the comments below.